Does your client avoid using the telephone because they're not comfortable with them? If so, they could be missing out on an important means of communication. 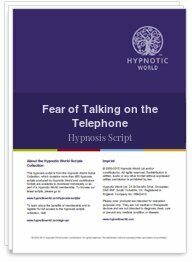 Your client can keep in touch with friends or loved ones as regularly as they wish, once they overcome the fear of talking on the telephone with this Fear of Talking on the Telephone hypnosis script from Hypnotic World.